General Hospital (GH) spoilers for Wednesday, November 29, tease that Valentin (James Patrick Stuart) will offer Nina (Michelle Stafford) a warning. When he realizes she’s still trying to manipulate Cassandra (Jessica Tuck), he’ll instruct her to wiggle out of any future plans. Valentin will believe Nina needs to ditch this fake friendship and trust that he can handle the threat. Nina probably won’t be willing to leave Cassandra alone and she certainly won’t be willing to back off Sam (Kelly Monaco. General Hospital spoilers say Sam will get riled in Wednesday’s episode. Nina might realize that Sam’s sticking to her guns on current Jason (Billy Miller). She seems to think Sam should keep her options open or else she’ll drive herself crazy. After Nina gets in Sam’s face about her issues, they’ll have a tense confrontation. Fortunately, things will be a bit calmer when Sam meets up with Lulu (Emme Rylan). It looks like Lulu might ask how Sam’s handling the twin chaos. Sam won’t pretend this has been easy, but she’ll just try to focus on how much she adores Miller’s Jason. She’ll hope that their love can get them through this. Meanwhile, Anna (Finola Hughes) will try to keep Finn (Michael Easton) out of her latest scheme. She’ll insist that Finn’s services are no longer necessary, but he won’t give up without a fight. GH spoilers state that Robin (Kimberly McCullough) will wonder what’s going on. She’ll walk in on their argument and seek some answers. Across town, Maxie (Kirsten Storms) and Nathan (Ryan Paevey) will give their loved ones some happy news. Mac (John J. York), Felicia (Kristina Wagner) and Dr. Obrecht (Kathleen Gati) will anxiously await the big announcement. Once Maxie explains that she’s pregnant, there’ll be cheers all around. Other General Hospital spoilers say Dante (Dominic Zamprogna) will receive a request from Patient Six (Steve Burton). At the police station, P6 will suggest that Dante might be able to help him. There’s a good chance Dante will dig into Andrew Cain’s past. There are probably some fingerprints just waiting to be found. 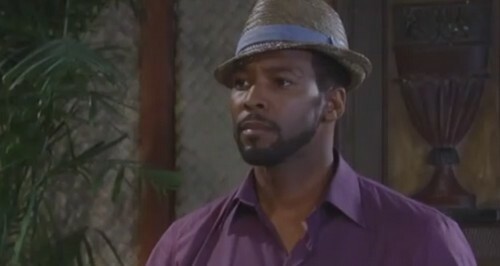 In Cuba, Curtis (Donnell Turner) will greet Andre (Anthony Montgomery) and contend that it’s time for a chat. Andre may be hesitant to divulge anything, but Jordan (Vinessa Antoine) will step up to change his mind. Once their conversation concludes, Andre will decide he owes Patient Six and Jason the real story. It sounds like the action’s heating up. We’ll give you updates as other GH details emerge. Stay tuned to the ABC soap and don’t forget to check CDL often for the latest General Hospital spoilers, updates and news.